Has anyone used Pendulum dowsing? Today I'm going to share an amazing technique that I use to get the right answers to my questions. That is Pendulum Dowsing. Some of you might be familiar with it and some may not. In his technique a pendulum is required which can be any string attached with an object having some weight. Hold the string or chain with your thumb and index finger, keep the elbow at rest on a table. Clear your mind from any kind of thoughts, be comfortable and take few deep breaths. Ask the pendulum to show what is "yes" and "no" answers. For most people, "yes" is a clock-wise swing and "no" is counter-clock-wise. "Yes" could also be back and forth, and "no" left to right. If it swings back and forth instead of counter clockwise or diagonally, (once you establish your "yes" and "no" responses) that means maybe or there's no answer to your question. then, re-phrase your question. To clear yourself, you can tap your thymus on the upper part of your chest before beginning. At the same time clear your head of all extraneous thoughts. The answers are coming from your Higher Self. First, ask the questions that you already know. See if those are right. Then come to your main questions. Your questions should be clear not confusing. I usually get the accurate answers. Main point is your mind should be calm and free of any thoughts. Try to be blank. For me the pendulum moves back and forth for " YES" and side ways for "NO". You can try for yourself. Re: Has anyone used Pendulum dowsing? Just curious, what if the pendulum doesn't move at all? I think a genuine test is by suspending the pendulum from a stationary object rather than the hand. The hand movt, however small and undetectable, may lead people to believe it is a genuine independent movement. 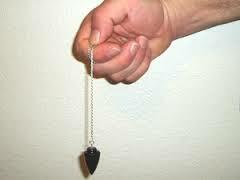 Pendulum will definitely move and you have to hold it in your hand because your energy is going to flow through it. It doesn't matter if your hand shakes, pendulum will move independently by itself.